The mystery of inheritance has captivated thinkers since antiquity, and the unlocking of this mystery—the development of classical genetics—is one of humanity’s greatest achievements. This great scientific and human drama is the story told fully and for the first time in this book. Acclaimed science writer James Schwartz presents the history of genetics through the eyes of a dozen or so central players, beginning with Charles Darwin and ending with Nobel laureate Hermann J. Muller. In tracing the emerging idea of the gene, Schwartz deconstructs many often-told stories that were meant to reflect glory on the participants and finds that the “official” version of discovery often hides a far more complex and illuminating narrative. The discovery of the structure of DNA and the more recent advances in genome science represent the culmination of one hundred years of concentrated inquiry into the nature of the gene. 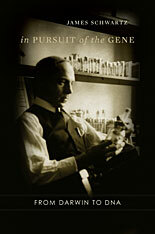 Schwartz’s multifaceted training as a mathematician, geneticist, and writer enables him to provide a remarkably lucid account of the development of the central ideas about heredity, and at the same time bring to life the brilliant and often eccentric individuals who shaped these ideas. In the spirit of the late Stephen Jay Gould, this book offers a thoroughly engaging story about one of the oldest and most controversial fields of scientific inquiry. It offers readers the background they need to understand the latest findings in genetics and those still to come in the search for the genetic basis of complex diseases and traits.